Barack Obama’s administration sees NATO as the nucleus for a global organization of democracies that will eventually replace the United Nations, believes an influential Russian newspaper. Washington wants NATO to be expanded by inviting counties like Australia, Japan, Brazil and South Africa and become a global organization tackling not only security issues but also epidemics and human rights, reports Kommersant daily on Friday. The next US Ambassador to NATO Ivo H. Daalder is a great supporter of this idea. Daalder, expert of the Brookings Institution and a foreign policy adviser to Barack Obama during the election campaign, is a strong proponent of the so-called Concert of Democracies. The idea, coined by the think-tank Princeton Project on National Security, is that the United Nations is outdated, because it was created to prevent a war between great nations, but now this threat is negligible. On the other hand, the UN is inefficient in dealing with local conflicts between small nations or between a great power and a small nation. Examples of those include conflicts in Darfur, Kosovo or, a more recent example, in South Ossetia. Authors of the concept, including Daalder, see the solution in an organization of democratic nations with resources both diplomatic and military to answer these challenges. According to them, democracies are eager to co-operate for the sake of defending human rights and providing securities, while authoritarian nations are not. If you drop out authoritarian regimes – including the great powers of Russia and China – then decision making will be quicker and action is far more likely to be taken. This Concert of Democracies will serve as a magnet for other nations and coerce them into becoming democracies in order to have a say on global affairs. The argument continues, saying that actions by this limited club including military ones will be legitimate, even if they violate national sovereignty of non-democratic nations, and will not need the sanction of the UN. 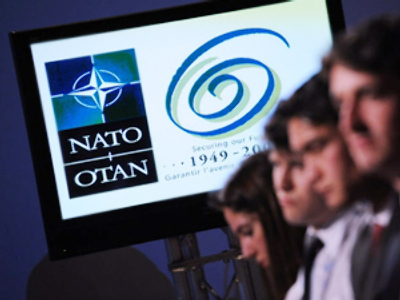 Daalder believes that NATO is a prototype of the proposed concert, being an alliance of democracies with a long success record, and can be extended to the new global organization. The upcoming anniversary summit of the alliance in April may be the time when Daalder presents Washington’s reform plan to other NATO members, newspaper Kommersant continues. The event will be a sort of ‘family reunion’ with no would-be members like Ukraine and Georgia invited. The event will be dedicated to a discussion of the future of the organization. Kommersant cites a source in the White House as saying that Vice President Joe Biden is among the supporters of the Concert of Democracies. During the security conference in Munich he mentioned that Washington wants its European partners to play a larger role, but this means they’ll have to take a larger share of the burden of maintaining international security. Inviting new non-European members to NATO will allow Europeans not to increase their expenditures. However it is not known what President Obama himself thinks about the idea, since he never commented on it in public. Russia’s ambassador to NATO Dmitry Rogozin said that while Daalder does support the idea of the Concert of Democracies, the willingness of other members of the alliance for a radical transformation remains a big question yet to be answered. “I hope to meet my new colleague as soon as he arrives in Brussels and find out what part of his views are merely public and what to expect from the new American team in NATO in real life,” the diplomat said. The idea is unlikely to find much support, as both countries that would be invited to a Concert of Democracies and even present-day NATO members may see it as a US-dominated club and be reluctant to join it, Viktor Mizin, a political analyst from the Moscow State Institute of International Relations, told RT. “I doubt that countries like Australia, South Korea or Japan for that matter would rush to support future military operation both financially and militarily,” he said. The idea to exclude Russia and China from global decision making is counterproductive. The expert added: “This community of democratic nations is like a new Holy Alliance [a 19th century alliance between Russia, Prussia and Austria meant to provide pan-European security and promote Christian values] and a very anachronistic idea,” he said. Ivo Daalder’s personal views do not determine US policy towards NATO, but it may help him in dealing with NATO members eager to increase the alliance’s influence, says Sergey Utkin from the Institute of World Economy and International Relations. “In a sense NATO is a union of democracies, but it doesn’t mean some radical changes of its structures are incoming. Most NATO members are satisfied with the present structures and some are tired of the alliance’s expansion,” he said. According to Utkin, NATO’s main task now is to adapt to modern challenges, and this includes better interaction with countries, that ‘have spent less time on the path to democracy’.